Welcome to CamWake91.com! 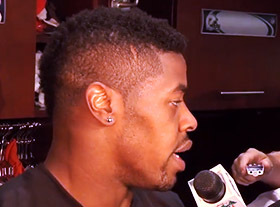 The official website of Miami Dolphins Defensive End #91 Cameron Wake. 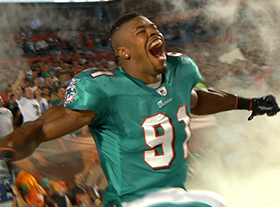 Go under the helmet and learn about who Cam Wake is and the journey he has taken to become a force in the NFL through pictures, news stories, videos and more. Thank you for your support and GO DOLPHINS! Cam played linebacker and defensive end at Penn State University. 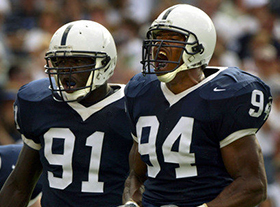 He finished with 191 total tackles, 8.5 quarterback sacks, and 24 tackles for loss at his time at Penn State. Check out our Videos page to see some highlights of Cameron in college. Cam signed with the BC Lions of the Canadian Football League in 2007. 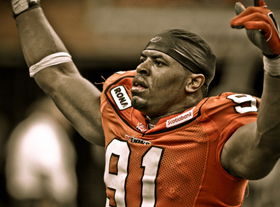 In just two seasons with the BC Lions, Cam won Rookie of the Year (2007), Defensive Player of the Year (2007), Most Outstanding Defensive PLayer (2008) and TSN's Friday Night Gladiator of the Year, the first defensive player to win the award (2008). After Cam's success int he CFL he got his chance in the NFL. The Miami Dolphins signed Cam in 2009. Since then Cam has recorded 28 sacks, 128 tackles and was selected to the Pro Bowl in 2010. Checkout Cam mic'ed up by the NFL Network during one of the AFC Pro Bowl practiced on our Videos page. On May 5, 2012 Wake signed a 4 year extension with the Miami Dolphins. During every game week the Media gets time to interview Cam about the upcoming game. Come back here every week and click the picture above to see what Cam has to say.